↑ 3.0 3.1 Shaw, p. 120. Atkinson, Rick (2007). Volume II: The Day of Battle, The War in Sicily and Italy, 1943-1944. The Liberation Trilogy. New York: Henry Holt. pp. 816 pages. ISBN 978-0805062892. Bimberg, Edward L. (1999). The Moroccan Goums. Westport, Conn.: Greenwood Publishing. ISBN 0313309132. Carver, Field Marshal Lord (2001). The Imperial War Museum Book of the War in Italy 1943-1945. London: Sidgwick & Jackson. ISBN 0330482300. D'Este, Carlo (2008). 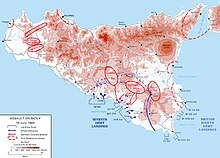 Bitter Victory: The Battle for Sicily 1943. London: Arum Press Ltd. ISBN 9781845133290. Hoyt, Edwin P. (2007) . Backwater War: The Allied Campaign in Italy, 1943-45. Mechanicsburg, PA: Stackpole Books. ISBN 978 0 8117 9982 3 Check |isbn= value: checksum (help). Molony, Brigadier C.J.C. ; with Flynn, Captain F.C. (R.N. ); Davies, Major-General H.L. & Gleave, Group Captain T.P. (2004) [1st. pub. HMSO:1973]. Butler, Sir James, ed. The Mediterranean and Middle East, Volume V: The Campaign in Sicily 1943 and The Campaign in Italy 3rd September 1943 to 31st March 1944. History of the Second World War, United Kingdom Military Series. Uckfield, UK: Naval & Military Press. ISBN 1-845740-69-6. Tomblin, Barbara (2004). With Utmost Spirit: Allied Naval Operations in the Mediterranean, 1942-1945. Lexington: University Press of Kentucky. ISBN 0813123380. Shaw, A (2002) . World War II: Day by Day. Hoo: Grange. ISBN 1840133635. Historical Museum of the Military Invasion of Sicily, 1943 (Museo Storico dello Sbarco in Sicilia 1943) Dedicated to the historical event which culminated in the liberation of Sicily and Italy from the German occupation. หน้านี้แก้ไขล่าสุดเมื่อวันที่ 15 กรกฎาคม 2559 เวลา 22:39 น.